In the case of a natural or man-made disasters, VirtuCrypt ensures that you retain sensitive data and system uptime. With VirtuCrypt’s Core Infrastructure Backup, your keys, certificates, configuration data, and other cryptographic objects can be replicated across multiple data centers, providing total assurance that your data is there when you need it. The Enterprise Core Infrastructure Backup Service provides total reliability and uptime by utilizing multiple geographically separated data centers to house your data, ensuring redundancy in the event of a disaster or loss of connectivity. The devices at each data center will be linked together and will replicate data between each other. In the rare event that devices at one data center become unresponsive, the devices at the second data center automatically assume all traffic, enabling immediate continuity of service. Unlike other backup services, VirtuCrypt stores all your data within hardened, FIPS 140-2 Level 3-validated Secure Cryptographic Devices, with an encrypted, mutually authenticated connection linking the devices at each data center. This extra level of security ensures your data remains secure from end to end. To support the accessibility of your data 24x7x365, VirtuCrypt allows you to seamlessly transfer from primary to backup resources without extensive time or effort, getting you the access you need when you need it. Whether planned or unexpected, system outages may severely affect an organization’s bottom line. 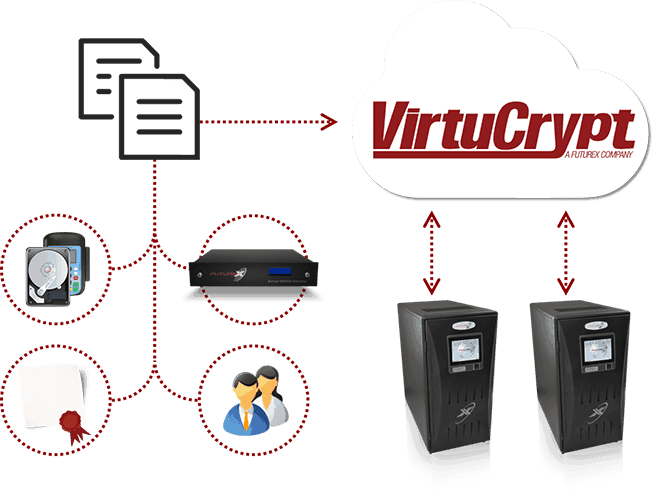 VirtuCrypt allows you to avoid downtime, with the backup system able to deploy immediately for your primary hardware.